Used to smooth wallcovering and other materials, to smooth and spread drywall compound, or as trim guide and paint shield. Sturdy construction with tapered working edge for flexibility. Non-marring rounded edges will not damage work. High carbon steel blades. Fits all standard handles. Seals down loose seams, stubborn curling edges, tears and overlaps in just 10 seconds and features a non-drip formula that makes application neat and easy. Sets faster and bonds stronger. Dries clear. Fits 4" wide wall strippers, glass and tile scrapers. TechniEdge Scraper Blade, Replacement, Suitable For Use With: TechniEdge Pivot Scraper and Most Other 4 in Scraper, Glass and Tile, 4 in Size, For Scraping and Paint Prep Use to smooth wallcovering. Hardwood roller and plastic handle with hole to hang tool. 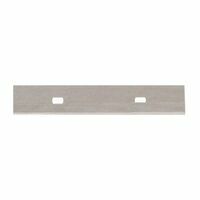 Versatile blades also snap off to fit 3-1/4" shavers. For repairing torn or peeling wallpaper. Provides a final bond between surface and wallpaper. Prevents peeling in high-humidity areas. Odorless. Equipped with winder to enable evacuation of more caulk from squeeze tube. Use to cut, slice, or trim wallcovering, paper, foil, etc. Metal frame holds single edge razor blade without tools. Hardwood handle with plated steel ferrule. One blade included. A water-mix concentrate for soaking wallpaper for removal from plaster or wallboard walls. Apply with sponge, paint roller, brush or low-pressure spray; paper then peels off easily with a wide blade scraper or putty knife. When wall covering removal is completed, an after-wash of FAST solution removes traces of old paste from walls before redecorating. Remove wallpaper; scrape paint or stickers off glass. Enameled die-cast head holds replaceable blade at angle. Patented enzyme action dissolves paste, making removal fast, safe and easy. Removes residual paste. Reduces wall gouging and repair time. Minimizes tedious scraping. 22 ounces will do a 12' x 24' room. Use to strip most types of wallpaper: traditional paper wallpapers, vinyl coated papers, paper-backed vinyl wallpapers, solid vinyl wallpapers, foils, mylars, grasscloth, textiles and even painted wallpapers. Clings to vertical surfaces. Apply with sprayer or roller. Non-toxic. Mildly scented. One gallon will cover about 10' x 12' room with 8' ceiling (300 sq ft.) Coverage will vary with porosity of wallpaper and thickness of product application. Great for use with any type of border or wallpaper, any pre-pasted or non-pasted materials with any backing. Contains exclusive mold and mildew shield, premium quality, excellent adhesion, strips easily. Goes on pink to show coverage, dries clear. Separates and lifts waterproof wallcovering to allow removal solution to penetrate and loosen adhesive. Self-aligning, free-floating Tiger Claws cutting module provides quick perforating in easy circular movements across or up and down without damaging walls. Use on vinyls, foils, flocks, painted-over, or coated wallpaper. Designed with the perfect scraping angle to remove wallpaper without wall damage. Also great for smoothing off walls and ceilings before painting or hanging wallpaper. Faster, easier and safer than razor-edge scrapers, replaceable blade has two cutting edges, ideal for scraping off residual adhesive and paint drips. Great for use with any type of border or wallpaper, any pre-pasted or non-pasted materials with any backing. Contains exclusive mold and mildew shield, premium quality, excellent adhesion, strips easily. Goes on pink to show coverage, dries clear. Stainless steel blades with plastic handles for a comfortable grip. Fits left or right hand. Use to cut wallcovering or paperhanging.